Land value only, tear down, do not disturb owner. Buyer must connect to the sewer within 3 months. Original Mackle home with parquet floors. Selling for LOT value. Exceptional location on Curtiswood Drive. Build your dream home on a tropical Island in this Premier location. Desired North/South exposure, Showing can be scheduled if needed, but its priced at the LOT value to purchase. AS IS. Home has hurricane shutters and Beach Club membership. Home condition is very rentable while designing and approving final plans. Oversized Vacant Lot for sale. Put your creativity to good use and design your dream home in the dream island.Located in the heart of Key Biscayne on the quiet street of Westwood with 7,835 sq. ft. Price includes soil test and updated Survey and Schematic Design for a new proyect. This beautiful 4 bdrm 3 bath home in move-in condition, has been totally renovated with an updated kitchen, new appliances, updated bathrooms, tile floor and hurricane proof windows. Natural light through out blends in with plenty of outdoor sitting for entertaining, complemented with recently designed waterproof awning. Same owners since 1970 filled with happy times and good vibes. 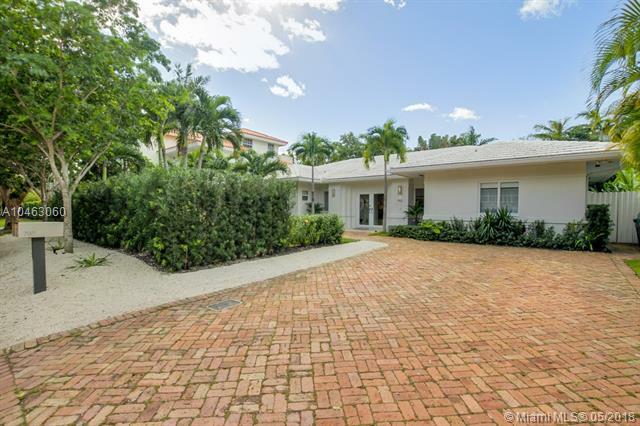 Renovate existing home, or build a new home on this private 7656 sq ft corner lot in Key Biscayne. Full set of plans awaiting approval for a 3 story 6 Bed 7.5 Bath home with elevator, rooftop terrace with ocean views, covered parking and more. Seller financing available!! Seller architects available to adjust plans to your liking. Seller would build to suite for end user. Gorgeous home with fantastic split floor plan featuring 5 Bedrooms, 4,5 Bathrooms and impact windows. 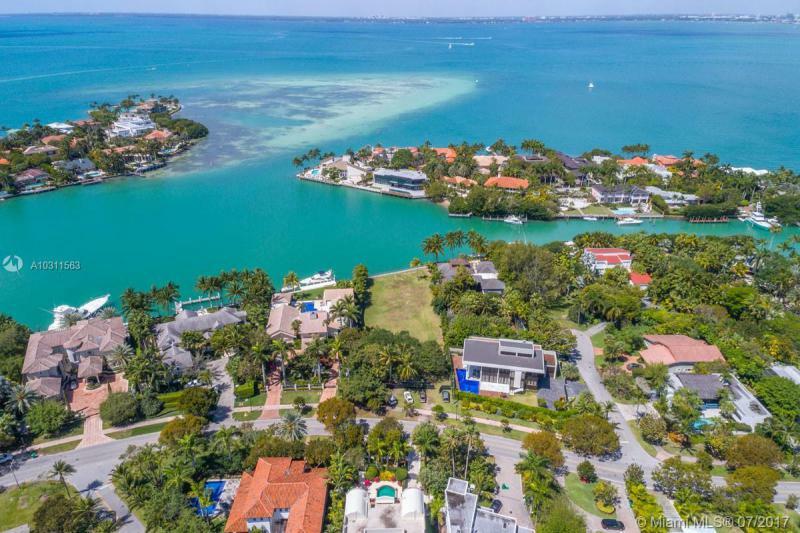 One of the best opportunities in the market to live in paradise island Key Biscayne with the comfort and space of a house at an affordable price.Dont miss it! COMPLETELY REDONE INTERIOR, POOL HOME WITH 4 BED/3 BATH. LIVING, DINING AND FAMILY ROOM.BRAND NEW WALLS, KITCHEN, BATHS, APPLIANCES, NEWER AIR CONDITIONER AND POOL PUMP. TRUE SQUARE FOOTAGE DIFFERS FROM TAX ROLL. ALL WORK DONE WITH CITY PERMITS. VERY LIGHT AND BRIGHT. IT WILL NOT LAST. WALK TO THE BEACH, SHOPPING AND SCHOOL. 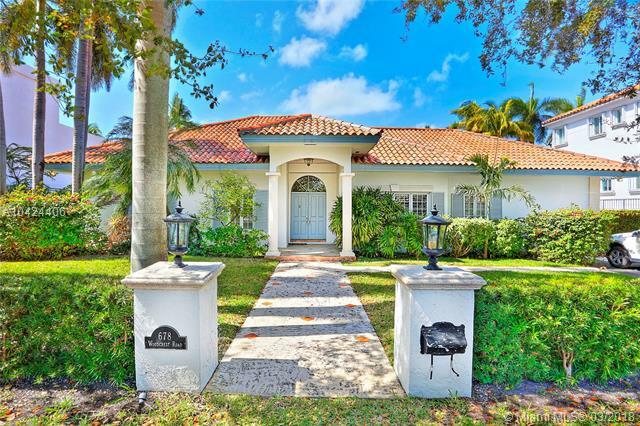 Cozy and charming, fully remodeled home in the heart of Key Biscayne. It features 4 bedrooms and 3 full bathrooms; impact windows and sliding doors throughout the space. Brand new swimming pool and porch area. Modern kitchen open to living and dining. 1745 SQ. Ft per survey when home was purchased in 2016. Absolutely Charming and beautiful home which has been completely remodeled with great finishes and it is ready for the new buyer to move in. This home is open, bright and has tons of natural light throughout. The magnificent open floor plan offers 4 bedrooms, 4 full bathrooms, great size kitchen, ample living room and dining room area, family room, beautiful pool and patio for those who like to entertain and it is located on a wonderful and quiet street.Please call or text for appointment. Duplex Zone lot. Plans approved by the Village of Key Biscayne to build 2 duplexes. Construction started. Finished Duplex price to be negotiated, This price reflects the land value. Owner completely gutted and renovated home with top of the line finishes throughout: Spanish modern tile, new A/C unit with Nest A/C and heating system, new plumbing and electric, LED recess lighting and dimmers, wood baseboards, PGT hurricane proof windows and sliding doors. Security system. State of the art large and modern kitchen, with quartz countertops, top of the line appliances and PROFESSIONAL VIKING GAS STOVE. 4 spacious bedrooms with electric shades, including master suite and guest suite, walking closets and plenty of storage space throughout. All 3 modern bathrooms have jacuzzis. Outdoors new wooden fence, new pool with heating system, front yard, sprinklers system and much more. This home has perfect distribution and natural lighting, ideal for family or entertaining. This stunning Contemporary-Modern 2 story Estate Home is custom built with the highest quality materials, finishes & details. The first floor of this masterpiece offers high-vaulted ceiling architecture with exposed rough wood beams flowing into dining area for open and very sunlit thru-glass floor-plan. A large Master Bedroom is comfortably located in the 1st floor for added convenience along with ample top of the line equipped kitchen flowing-to the adjacent den/family room. Additional rooms are privately located on 2nd. floor. This home offers a front terrace, Impressive covered rear patio and open pool area to relax and entertain in. Must see home to appreciate this unique Island beauty, a unique opportunity to own it and enjoy it. 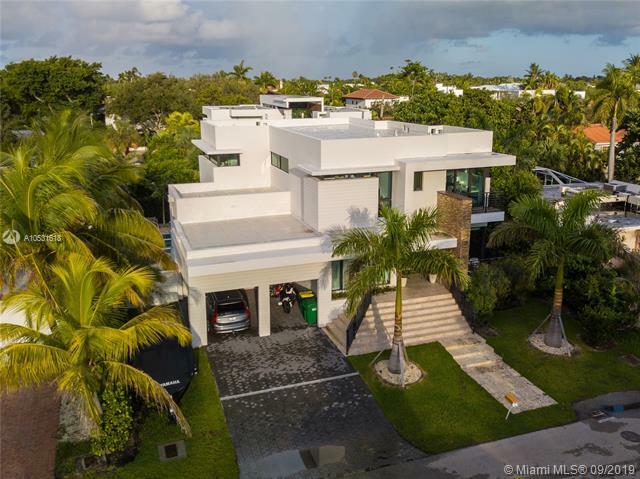 Newly constructed, exquisite 2-story modern smart home, This bright and spacious 6 BD / 5 BA / 1 HB features impact windows & doors, Crema Marfil 24x24 marble floors, volume ceilings, sound system, immaculate European kitchen with top of the line appliances & more! Delightful covered patio overlooking the heated pool/spa with remote control for temperature, waterfall feature & spa settings. 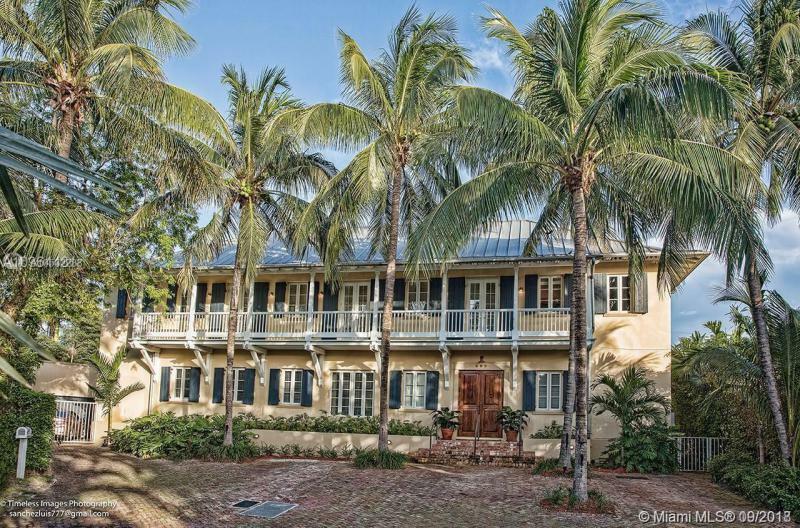 Must see one of a kind home on the paradise island town of Key Biscayne. Enjoy the island life in this chic, multi-level gem featuring a spacious layout w/formal living/dining, family room & elevated 2-CG. Other highlights include abundant natural light, high ceilings, recessed lighting, high impact windows/ doors & impeccable marble/hardwood floors. Newly renovated kitchen boasts sleek, sophisticated natural quartz countertops & island, high-end stainless-steel Sub Zero and Miele appliance. The elegant and bright master suite presents an inviting sitting area with custom built-ins, marble bathroom with dual sinks and spa, his/hers walk-in closets & private terrace overlooking a tropical garden and sparkling pool. The Caterpillar generator provides electricity for an entire month. Key Biscayne-a golf-cart-friendly village offering amenities at your doorstep. VILLA ROSA is a tropical dream 5-bedroom home designed by renowned architect CESAR MOLINA. Oversized lot (12,200 sf) on VERY quiet street. Caribbean style. Meets hurricane codes. Huge covered terraces with lots of ceiling fans. Charming kitchen with island, wine cooler, separate fridge, two ovens, two dishwashers, subzero fridge. Master bedroom with private terrace.Enormous closet with safe. Double Master-bathroom with sauna. Big driveway and enclosed garage. Maids quarter. Luxurious and charming house in the exclusive area of Key Biscayne. This property was updated with a high standard of finishes, high ceilings, customized California wood closets, marble throughout, electronic window treatments, black-outs, shades. Dont be the last to let you fall in love with this enchanting home. Located on Mashta Island, one of the most prestigious neighborhoods and single home communities in KeyBiscayne. Luxuriously upgraded 2 story home with high impact glass windows throughout. Enjoy the backyardspace, swimming pool, pool bar and BBQ area. Spacious master bedroom and bathroom includes openbalcony. His and hers walk in closet, double sink with steam room and Jacuzzi. Sound security system incommon areas and electronic curtains. This 2 story home brings the comfort and exquisite design. Close tobeach, parks, restaurants and top ranked schools. Absolutely spectacular and unique property with 27,656 Sq Ft of land on Key Biscayne. Build your dream home on this outstanding lot which is on prestigious Harbor Drive and Hurricane Harbor. 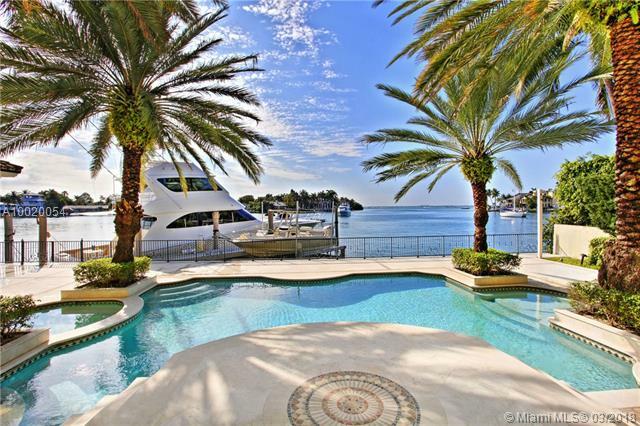 This is a boaters dream with over 100 feet on the water and with incredible and spectacular views of the Bay. This is ONE OF A KIND PROPERTY! This gorgeous and spectacular waterfront residence is located on the perfect site of Hurricane Harbor with breathtaking views of the harbor & bay.This home is elegant,sophisticated with a great floor plan.Formal living room with double height ceilings,dining room,office,ample kitchen,family room,5 beds+staff,7.5 baths+garage.This home has plenty of natural light throughout,it is gated and located on prestigious Harbor Drive.Savor your yacht in front of your home while you enjoy the pool,gazebo+terrace.